For the first time, the work of Iranian poet Forugh Farrokhzad is being brought to English-speaking readers through the perspective of a translator who is a poet in her own right, fluent in both Persian and English and intimately familiar with each culture. Sin includes the entirety of Farrokhzad’s last book, numerous selections from her fourth and most enduring book, Reborn, and selections from her earlier work and creates a collection that is true to the meaning, the intention, and the music of the original poems. 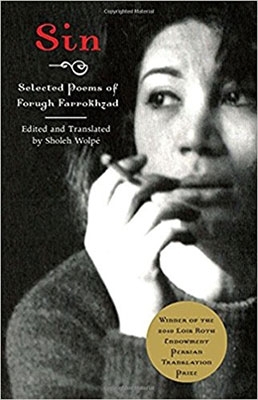 Farrokhzad was the most significant female Iranian poet of the twentieth century, as revolutionary as Russia’s Akhmatova and Tsvetaeva and America’s Plath and Sexton. She wrote with a sensuality and burgeoning political consciousness that pressed against the boundaries of what could be expressed by a woman in 1950s and 1960s Iran. She paid a high price for her art, shouldering the disapproval of society and her family, having her only child taken away, and spending time in mental institutions. Farrokhzad died in a car accident in 1967 at the age of thirty-two. Sin is a tribute to the work and life of this remarkable poet.